Melt-in-your-mouth 2-Ingredient Almond Cookies. The most amazing deliciousnesses of all times! Paleo, vegan, low-carb & absolutely delicious! After scrolling through an endless Pinterest feed of Christmas cookies I couldn’t help but think the world needs quick and easy to make, healthy Christmas Cookies! The same thoughts went through my mind when working on a Flourless Peanut Butter Cookies recipe before. All the recipes out there are way too complicated! Why not keep it simple my friends? I still can’t believe how only 2 ingredients can be enough to make melt-in-your-mouth cookies. These Almond Cookies will knock you off your feet. They are gluten-free, dairy-free, vegan, mapely sweet, nutty, soft, and simply amazing! Oh and they’re paleo, too! How awesome is that? I’m sure I forgot a couple denominations. Mix almond flour and maple syrup until you have a dough-like consistency. Make sure you count your ingredients. It’s almond flour (1) plus maple syrup (1) equals two (2) ingredients. Ha! 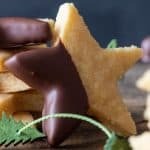 Remove the upper parchment paper and leave the rolled out dough on the bottom layer of paper and cut out stars or whatever shape cookie cutter you have on hand, then remove the dough in between the stars. This is the magic trick to get pretty shaped cookies. Most people cut out the cookies and then try to move the cut-out-cookie-dough onto a baking sheet but it gets all distorted in the process. It’s much easier to just leave the cut-out part on the parchment paper and use a flat knife or even tooth pick to remove the excess dough around the shape. Then transfer the paper full of stars onto a baking sheet. Bake your almond flour cookies for 15-25 minutes at 250 F (120 C). Remove from the oven and take the edges of the paper to transfer the whole thing onto a cooking rack. Let cool down completely. Important notes: you will feel very tempted to eat the dough and that’s ok, it’s fine to eat “raw”. YAY! However, remember, that the more dough you eat the less almond flour cookies you will end up with. Uh-oh! So absolute mega bonus tip is to transform these melt-in-your-mouth almond cookies into Chocolate Almond Cookies. It’s a 3-ingredient cookie then but hey, still pretty good, eh? So, what’s the best way to dip them into chocolate? There is quite an art to it, you know? First, you will want to put your completely cooled cookies in the freezer in a single layer. Use a baking sheet for this. Freeze them for a while. Like 20 minutes or so. Then, melt your favorite chocolate in a double boiler over veeeery low heat stirring constantly. If you use high heat or stop stiring the chocolate starts to clump and becomes all yucky. Be patient. It only takes a couple of minutes. Once the chocolate is nice and runny, remove from the heat. Take out your ice cold cookies and dip into the chocolate, lift up and let excess chocolate drip back into the bowl. The chocolate should harden pretty fast due to the coldness of the cookies. Once the cookie stops dripping, lay on the cold baking sheet on which it was in the freezer. Repeat this with all cold almond cookies. Once you are finished, return to freezer for about 10 minutes and they’re good to eat. These are an AWESOME edible gift, too by the way. 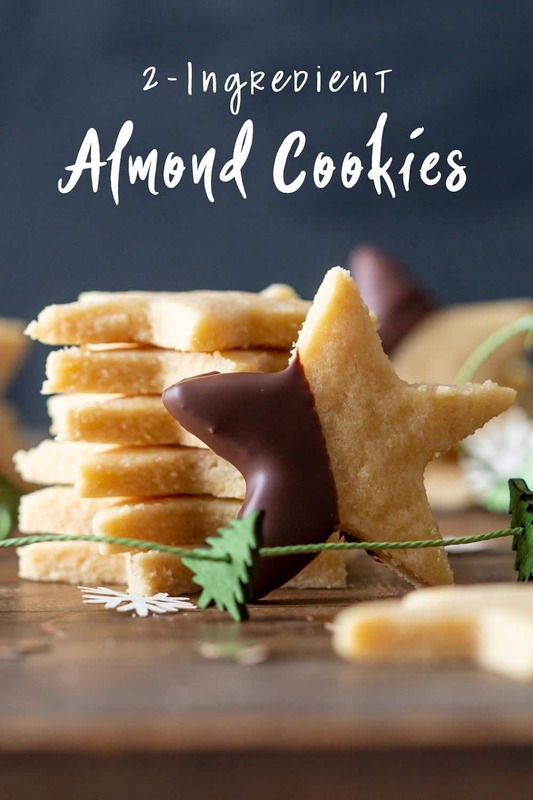 The almond cookies without chocolate are probably better as a gift, less messy. Wrap the dough in parchment paper or cling film and freeze for approximately 15 minutes. Roll out dough in betweet two pieces of parchment paper the size of your baking sheet to about 1/4" (0,5 cm). Remove top layer of parchment paper. 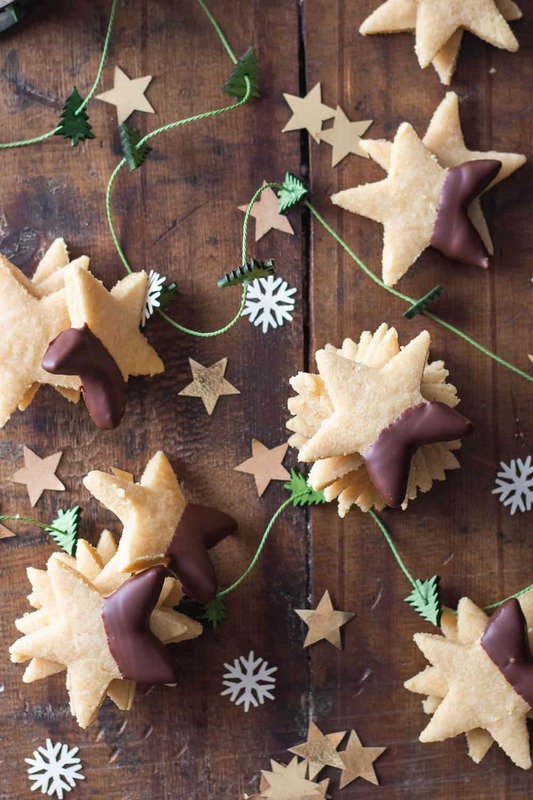 Cut out cookies and remove excess dough in between shapes with a knife or tooth pick. NOTE: To avoid dough from sticking to the cookie cutter, dunk it in water before you cut out the next one. Lift up parchment paper full of cut-out cookies at edges, place on baking sheet. Repeat the rolling out and cutting out and placing on a second baking sheet until all dough is used up. (Use left over dough to form little balls of about 1 tsp dough and place on free space on the baking sheet). Bake cookies for 15-25 minutes depending on how thick you rolled them out. Keep an eye on them at the 15-minute mark. Almond flour burns easily. Remove from the oven, lift the parchment paper on the edges and place all the cookies on a cooling rack this way. Let cool completely. Then store in an airtight container. To make Chocolate Almond Cookies refer to instructions given further up in the blog post. No, you cannot use any other flour but almond flour! Different flours have different chemical compositions. Almond flour is high in protein and fat and low in carbs. Wheat flour is low in protein and fat and high in carbs. Coconut flour is extremely high in fiber. Flours can NOT simply be exchanged in recipes. Hazelnut flour "might" work but I haven't tested myself. Maple syrup "might" be exchanged by honey or agave syrup. I haven't tested it myself though so I can't guarantee it will work. Hi, is almond flour and ground almond the same thing? 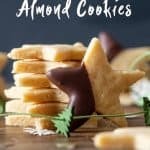 I have ground almond at home and was hoping to make this? I have almond MEAL instead of almond flour, could that work as well? flour and 1600 cal for 1 cup of syrup equals 96 calories per cookie. Great for my husband who is trying to gain weight, not for me who struggles to lose. I already ate 4…so good. Whoops, I made a mistake…there are oly 800 calories in cup of maple syrup…that brings the calories down to 66 calories per cookie…that makes me feel better. I’m still transitioning from the Whole30, so wanted to try these. I’ve made them twice and have been very happy with the results both times. I did bake them at 300 vs 250 (for about 15-18 mins) and they were crispy outside and still a little chewy inside. Two tips that made them even easier: (1) I wrapped my rolling pin in waxed paper and taped it on, then rolled out the dough onto the same sheet of parchment I baked the cookies on, per the instructions. (2) I left the dough in the freezer overnight (sort of by accident ;). It was a little bit difficult to roll out at first, but much easier to get the cookies out of the cutters! Awesome!! Thanks for the tips. Never thought of sticking the parchment paper on the rolling pin. That’s brilliant! Yes, very cold dough is definitely easier to work with. I agree. You’re a winner with this one seriously! I love when a baker/chef gives step by step instructions. And your video to this recipe is amazingly detailed! Love it! I love making these cookies with my 3 yr old. I used Agave and it was perfect. I’m so happy to read that Ayla!! these are great – thank you for the recipe. one question – how long do they keep at room temperature? I’m not sure Sara. I store them in the fridge and in the fridge I’ve kept them up to a week. I can’t tell for sure but I assume yes. I haven’t tried it. You can always try with smaller amounts so you don’t waste too much almond flour. Great!!! Thank you so much for the info! I admit I was skeptical that these would be “delicious” as you emphasize in your post, several times, but I am eating my words…and cookies! I have my vegan daughter and her partner visiting for the holidays, and I wanted to bake some gift cookies she might enjoy. I made these exactly according to your recipe, and oh.my.goodness they are simply amazing and amazingly simple to make. Yes, it might take some experimentation to find the right baking time and temp, my very first batch turned out perfect, in my opinion. I plan to dip them in 72% vegan dark chocolate, perhaps flavoured with orange or almond extract, and wrap them in pretty, seasonal packages for my friends, neighbours and family who need an indulgence while sticking to their diets. Thank you fir creating this! I’m sooo happy you liked the recipe Heather!!! How many cookies is a serving? The nutritional info is for one cookie. Too many to be LC or Keto. 5 grams carb per single cookie but they do look tasty! They are definitely not Keto. I’ve had feedback of people using a sugar-free Lakanto syrup that is Keto-friendly and that it works fine. Just made these little beauties! Yum! I did turn the heat up at the end to brown them up a bit, I like them that way. Left them for close to 30 minutes and they still didn’t brown for me till I turned up heat for five minutes to 350. So Delish! Thank you for this recipe. I will be a devoted follower now. Thank you so so so much for coming back and commenting. Your comment made my day! I’m just butting in, i always roll and cook on the baking paper, stops all that, clean too! I hope that helps. Merry Xmas. Same here, as shown and explained in detail in the video and in the recipe card itself. I wonder if she used the correct ratio of 2 cups flour to 1/2 cup syrup. She tells us in the recipe to roll out the dough between 2 sheets of parchment paper, and leave it on the bottom sheet while we cut the cookies out. And transfer the whole sheet of parchment paper with cookies on it to the baking sheet. Step #4 clearly indicates to roll out between two pieces of parchment paper, using the bottom sheet to move onto baking sheet. I just tried this for the first time. I popped mine in the fridge for about 5 minutes, then rolled it out between parchment paper and cut them out easily. It could be the consistency or even the humidity. I did find that I had to bake them about 35 minutes though. Is the temperature 250 degrees correct? That seems like such a low heat. Should it be 350 degrees? Thanks. Hi Mary, yes 250 is correct if you like them soft like I do. You basically just dehydrate them a bit to keep their shape. If you prefer them crispy like sugar cookies you can bake them at 350F for 18-ish minutes. I’ve tested that already and they become crispy but also start browning which is something I personally don’t like. Almond flour burns quite easily. I wonder if you could use macadamia nut flour to make them. I am going to have a go lovely thank you. I’m not sure delia. Macadamia has a higher fat content than almonds but definitely worth a try. Maybe make 1/4 of the the recipe to test first. Can these cookies be frozen after baking? yes!! They can be frozen. I love these have no sugar in them. We need more cookies like this. Thank you for posting these. I will have to try them. what can you use in place of maple syrup? I can hardly wait to try these! I could not find the ingredients amount for the chocolate version, which you said was further up in the blog post. Also since I hate cutting out cookies I was wondering if a cookie press would work or shaping the dough into a log and refrigerating before cutting into cookies. Also what about using equal amounts of confectioner “Swerve” (erythritol) and carefully adding water to make a syrup for those who cannot use sugar. (Don’t use the granulated as it is too grainy) Maple or almond extract could be added for the flavor. What do you think? Hi Jenny, melt chocolate to your liking. There is no amount suggestion. It depends on how many cookies you want to dip in chocolate. If you can’t have sugar, make sure it’s unsweetened chocolate. I haven’t experimented with anything but real maple syrup but I’ve had others tell me a sugar-free syrup called Lakanto works well apparently. I don’t know if you can get that where you live. Really want to try this but I don’t have maple syrup. Could I substitute molasses? I also saw someone suggested honey? Claire, I think your best bet is honey. I wouldn’t use molasses. Molasses usually only tastes good when mixed with sugar. you will have to find out for yourself. Until a dough forms. I haven’t tried it myself so I can’t tell. Start with maybe 1/3 cup and then go from there. Add more honey if needed. Do you use real maple syrup, or maple pancake syrup, or does it matter? The only maple syrup I know is real maple syrup made by tapping maple trees, collecting the sap and then cooking it down to maple syrup. I have never worked with any other so I can’t tell if it would work but you can always try with a small amount. Use 2 Tbsp almond flour and 1/2 Tbsp of syrup of your choice and then see if it forms into a dough or not. Lorena, all the 100% maple syrup I have seen have 50+ grams of carbs per serving. Can you recommend anything else? We have maple flavored syrup that is low carb. Would this work maybe? Hi Ruth, I haven’t tested it myself but I’ve had a ton of people on the Keto diet comment on the Facebook post of this recipe that a syrup brand called “Lakanto” works really well for this recipe. I don’t know if you can get your hands on that. If not I recommend you try with the syrup of your choice but simply with a very small amount. 2 Tbsp almond flour with 1/2 Tbsp syrup and then see if a dough forms or not. Can you add vanilla, almond, or lemon flavor? Definitely worth a try. I would assume lemon zest yest, vanilla and almond extract should work, too in theory. I have never tried myself though. Looks yummy! I can not have almonds was wondering if I could sub with hazelnut flour. It’s the same consistency. Just wondering what your thought were. I may try it anyway. Also what chocolate do you use? Is it dairy free? Hi Heather, yes, I’m almost certain it would work. I haven’t tried myself but like you say, it’s the very very similar in chemical composition. You can always try with a very small amount in order not to waste too much of the two precious ingredients. Try by mixing 2 Tbsp of hazelnut flour with 1/2 Tbsp maple syrup and see if you can make a dough as shown in the video with that. I use 70% dark chocolate which most brands make dairy-free. My husband is allergic to almonds. I use hazelnut flour in all recipes calling for almond flour, and it bakes the same. Awesome!! Thank you for the feedback Melissa! Thank you so much for letting me know. I’ve had a lot of people ask for low-carb options. I will tell them Lakanto works. No, maple syrup has too many carbs for Keto. Someone mentionend Lakanto maple flavored syrup (which is Keto) works great so you could try with that. No, Karen. Maple Syrup is not Keto. Merry Christmas. Can’t wait to make these , wondering if you can freeze these after baking. And pull out a few at a time? Hi Michelle, yes!! They freeze perfectly! I recommend freezing them in a single layer on a baking sheet and then once frozen add to an airtight bag or airtight container to avoid from sticking together. Would this be possible with coconut flour? If so, how? My son can’t have almonds. No Crystal, coconut flour has a completely different chemical composition to any nut flour. You can’t use coconut flour. Instead of cutting out, I’m going to try rolling and baking, and then cutting with pizza cutter, like shortbread. Recipe sounds great. Thank you! That sounds like a brilliant idea!!! Thank you, Lorena, for developing such a simple, healthful cookie recipe! I also love the tip of removing the dough from around the cut cookies! Why did I never think of that? Duh! Hi! I can’t have sugar, and was wondering if it would be possible to use sugar free almond flavored coffee syrup in place of the maple? Thanks! Oh gosh, I have no clue Rachel. I’m sorry :( I’ve never seen that syrup before. It it is the same consistency and stickiness I would assume so? You can use sugar free maple syrup! I use sugar free maple syrup for lots of recipes. Publix brand tastes great. I plan to try these using sugar free syrup. Great. Please let me know how they turned out to be able to suggest for anybody looking for a Keto-friendly syrup. They are delicious! I got lazy with the cookie cutter after a few and just used a pizza cutter to gently cut into squares and triangles but they look pretty good! That’s a great idea Stephanie!! Honestly, I only cut pretty shapes if I want to give them away as a gift. For us, squares and triangles do just fine, too. Lol. Awesome recipe. Do you think we can try the same recipe with coconut flour? Hey Anil, no this recipe doesn’t work with coconut flour. Coconut flour has a completely different chemical composition of loads of fiber and little fat. My grandson can’t have any nuts or wheat flour. It’s so hard finding recipes for him so he isn’t totally left out at Christmas. Thank you so much for this recipe! Mine take a lot longer than 15 minutes, and I’m using simple syrup, but they are yummy! Is it possible that this could be a pie crust too? Hm. I’ve never tried. I guess, if you cooked it really really well it could potentially work. Not sure however. The cookies are rather soft and melt in your mouth. I’m afraid as a crust it would fall apart. I am making these again! They were so delicious the first time. I added lemon zest to the tops of the cookies before baking. 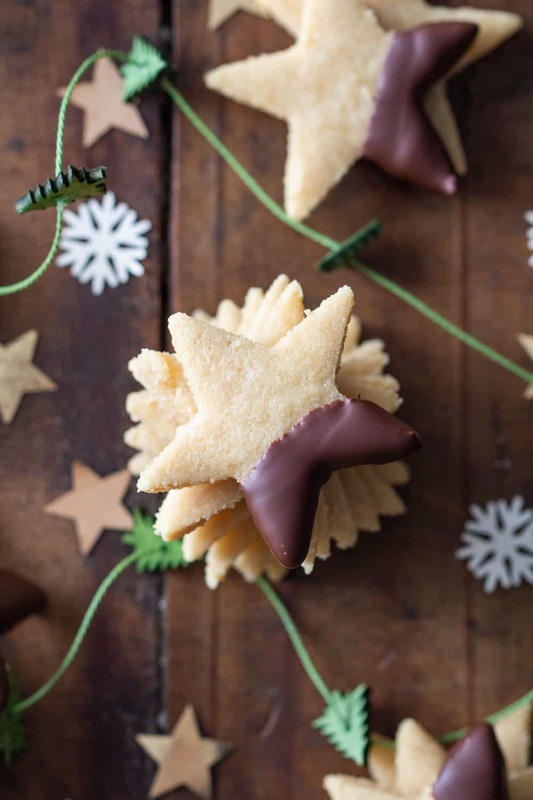 The zest was the twinkle part – since I used a star cookie cutter. So good. Thank you! I love the Bob’s Red Mill brand. It’s the finest I’ve found so far without any big clumps. Awesome!! Thank you so much for the info. A friend just asked me if I think this will work and I didn’t know. Looks so good and perfect for Christmas! Hm, not sure. Rice malt syrup is more like honey so it’s stickier. Certainly worth a try. I would try first with maybe a 1/4 recipe, just in case it doesn’t work. So you don’t waste the precious almond meal. Hi. Do you think sugar free maple syrup could be used? Hi Barbara, I’ve never heard of sugar-free maple syrup. What is that? I live in Canada so the only maple syrup I know and use is grade A or grade B real maple syrup made from only sap from the maple trees. These are wonderful! Can’t wait to try them. Does anyone know where I can find that packing? It’s so cute! Can these cookies be made with coconut flour? Where did you get the packaging and the Christmas tree wrap for the packaging at? Hi Marie, the packaging was from some pencils I got as a gift and the Christmas Tree Wrap was from an art supply store here in Montreal called De Serres. Some flours are more like a meal…. do they work in this recipe, or do you need to use blanched almond flour? I’m afraid it has to be a nut flour because of the fat content. Could you sub honey for the maple syrup? Hi Coley, I’ve never tried but “in theory” yes! Wow..hope the four is on the shelf at my super…..yum!! Hi Barbara, in Canada I find it in the health food section of my super market or at health food stores. In Germany it’s found in the baking supply section, but not next to the flours but rather next to chocolate chips and sprinkles and stuff like that. Great recipe! Thanks. What other flour could be used for nut allergy? Hi Mel, I’m afraid this recipe only works with nut flour. I can only suggest trying with hazelnut flour instead of almond flour but no other flour has enough fat to not need a binder and little enough fat to not become butter when processing to flour. In fact I liked all your page!!! Thank you so much Joelle for your lovely comment! Wow, what a unique recipe! I just wanted to confirm the baking temperature- is it really 250f? So low? I guess you aren’t really baking these and more like drying them. Right? I made these but are very moist after baking, suggestions? Hm. What brand of almond flour did you use? I wonder if that plays a role. I use Bob’s Red Mill because they have the finest flour I’ve found so far. Also, did you use the same ratio I did? Did you roll them out thin enough? If they are thicker than in the photos you would have to bake them longer of course. Do you have an oven thermometer? If your oven doesn’t heat up to the proper temperature it will take longer for these cookies, too. What type of cookie sheet do you use? Very heavy? Insulated? They are heavy and thick. I use the OXO non stick pro sheet pans. They have like a texture to them. I can’t believe these have only two ingredients. I can’t wait to try these gluten free wonders! You did nothing wrong. They are soft and chewy. That’s how I like them. If you prefer them crispy, try baking at 350F for 18-ish minutes.